Massachusetts is set to make history Tuesday. Two medical marijuana dispensaries — Cultivate Holdings in Leicester and New England Treatment Access (or NETA) in Northampton — are planning to open for the first legal recreational marijuana sales not only in the Bay State, but in the entire eastern half of the United States. Town and store officials are expecting the historic day to be met with historic crowds. “We’re prepared for thousands,” Sam Barber, the president of Cultivate, said during a press conference Monday morning. Under Massachusetts state law, it’s illegal for anyone under 21 to purchase or consume recreational marijuana. Before even entering a dispensary, customers have to show a valid, government-issued ID proving they’re of legal age. And amid the expected influx of excited customers, the stores are also stressing that public consumption is also illegal. In other words, no toking up outside the dispensary. While they’ll be primarily focused on directing traffic, there will be a significant police presence at both Cultivate and NETA. “It will be a celebratory atmosphere, but with a real educational and security focus,” Wade said. Both stores are opening at 8 a.m. Tuesday morning. Cultivate plans to be open until 8 p.m. Tuesday, and will be open for business from 10 a.m. to 8 p.m. seven days a week. NETA’s Northampton location will be open from 8 a.m. to 10 p.m. seven days a week. Barber asked Monday that customers not begin arriving and lining up before 7 a.m. Tuesday. Amanda Rositano, NETA’s director of compliance, conceded that people might start showing up before then. How bad will the lines be? “It’s certain that we will see somewhat of a crowd tomorrow,” Rositano said. That may be an understatement. Both Rositano and Wade described their stores being inundated by constant calls over the past weeks from people asking when they would be open. Additionally, the forecast in both Leicester and Northampton is calling for a mix of rain and snow overnight Monday through Tuesday morning. “It doesn’t look like Mother Nature is going to be super cooperative,” Wade said. However, both dispensaries are hoping to make the wait tolerable — and even fun. Rositano said NETA plans to have water and coffee for those waiting outside. At Cultivate, Wade says they’ll have heated tents, bathrooms, music, and even a food truck for those in line. Cultivate’s on-site parking lot at 1764 Main St. will only be available to customers requiring handicap-accessible parking and registered medical marijuana patients Tuesday. All other customers are asked to park about a mile down the road at Everlast Nursery, located at 1894 Main St. off Route 9. From there, the dispensary will be running shuttle buses to pick up customers and bring back and forth to the store. In Northampton, officials are also preparing for significant increase in vehicle — and pedestrian — traffic, according the the city’s police chief, Jody Kasper. Kasper said Monday that police are turning Fulton Avenue — which provides access to NETA’s parking lot — into a one-way street, with officers on both ends directing traffic. “People will be able to turn onto the street off of Pleasant Street and then when they leave the lot, we’ll have people exiting onto Conz [Street],” she said. Rositano says a few of NETA’s neighbors across Conz Street, including the Fairfield Inn and the Daily Hampshire Gazette, have also agreed to make their parking lots available to customers Tuesday. Many banks have been hesitant to get involved in the legal marijuana business, due to the substance’s continued prohibition at the federal level. That’s created headaches for many businesses operating in the fledgling industry. Cultivate will not be accepting credit cards, and Barber said Monday that the shop doesn’t expect to have its debit card terminals up and running until around noon. So if you’re getting there early, bring cash. NETA, on the other hand, says it accepts cash or debit and credit cards with a PIN number. “And again, there is always cash,” the company adds. Will there be limits on what I can buy? Massachusetts state law prohibits shops from selling more than one ounce of marijuana flower or five grams of concentrate to a single customer at a time. One ounce is also the legal limit for the amount of weed a person can possess in public in Massachusetts (though they can have up to 10 ounces at home). Barber said Monday that he doesn’t anticipate Cultivate putting any additional limits on how much single customers can buy Tuesday, but noted they could possibly run out of certain products. Both stores say they’ve been ramping up production for weeks in anticipation of Tuesday’s opening. NETA is setting an initial purchase limit of an eighth-ounce of flower, but there won’t be any additional restrictions (aside for the state-imposed maximums for other, infused products, like edibles). “That’s really to ensure that our flower supply lasts through the day and that we have enough for everyone,” Rositano told Boston.com Monday afternoon. The company’s website says the limits will be evaluated and potentially changed or removed on a daily basis. It could be a good idea to pick a different day to visit; Massachusetts has 40 other medical marijuana dispensaries as well. That said, it should still be easier for those enrolled in the state’s medical marijuana program to bypass the madness Tuesday. Both Cultivate and NETA will have separate lines and service stations for Massachusetts residents with a patient ID card. Rositano said she doesn’t expect medical patients to have to wait outside. And as required by state law, both shops say they’re reserving 35 percent of their inventory for medical-use sales. “Our patients remain our top priority,” Kim Napoli, the diversity program director for NETA, said Monday. 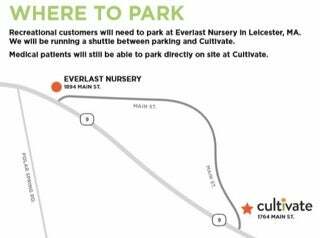 And as mentioned earlier, Cultivate is allowing medical patients to park on site, rather than at the nursery down the road. What if I’m from out of state? Again, Cultivate and NETA aren’t simply the first two dispensaries selling recreational marijuana in Massachusetts. They will be the first in the United States east of the Mississippi. And while there are no restrictions on out-of-state residents coming to Massachusetts to buy marijuana (to the contrary, many are expected), officials are asking customers to follow the rules. Consuming marijuana in public, including in your car, remains illegal, as is driving under the influence of the drug. Also, due to the drug’s federal prohibition, it’s technically illegal to transport cannabis across state lines — even into Vermont, where adults are also allowed to possess marijuana for non-medicinal purposes. Since it will likely be years before social consumption establishments, such as cannabis cafes, crop up in Massachusetts, out-of-state customers will probably have to find a pot-friendly rental or local friend’s (or relative’s) house to legally consume their purchase. “It is the holiday travel season,” Wade noted.